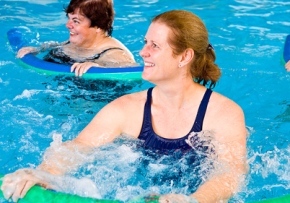 A course of water aerobics classes has been shown to reduce the amount of pain-killing medication women request during labor. Research has shown that, as well as being safe, the gentle exercise has the benefit of making it easier to give birth. Rosa Pereira led a team of researchers from the University of Campinas (UNICAMP), Sao Paulo, Brazil who investigated the effects of the aquarobics class on a group of 71 expectant mothers. About half of the women were randomly allocated to attend three 50-minute sessions a week over the course of their pregnancy, the others did not take part in the water aerobics. Exercise during pregnancy has been the subject of much debate, the main concern being that it may interfere with fetal/placental demands, increasing the risk of abnormalities or compromising fetal development or growth. The researchers found that there was no harmful effect on the cardiovascular health of the women who practiced water aerobics. Neonatal results from the study confirm the wellbeing of the newborn infants born to mothers who took part in the aquarobics. Previous articleLamaze Method To Make You Aware Of The Labor Process!